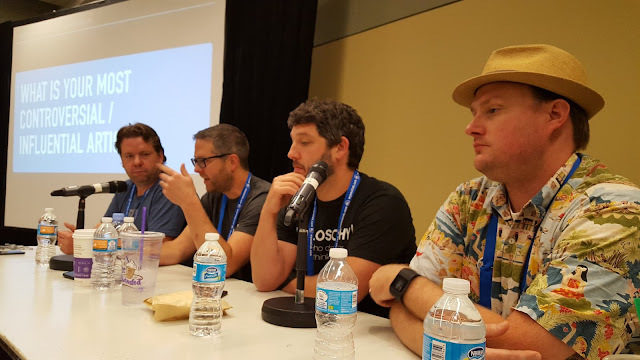 Homebrew Bloggers Rountable, I'm likely saying something stupid here but at least I'm into it! It's been a few days since I returned from HomebrewCon 2016 but my mind, unlike my NEIPA's, is only just now starting to clear from the haze. This years conference was much different than my last experience in Philly a few years ago, last time I had no commitments, no real connections with out of towners, save for a few people, and drank entirely too much (I left Gordon Strong's talk to puke at the Hard Rock Cafe next door). This year that was all different, from Brulosophy xBmt's, to Basic Brewing Episodes to presenting as part of a panel on blogging, it made for a really busy but fun conference. One to remember for sure, though I still probably drank too much I didn't throw up. As I mentioned in my itinerary post I was late getting down to Baltimore and only arrived Thursday evening where I planned to meet up with two of my Philly buddies Chris and Tom. They were at the bar so I walked into Craft Beer Kickoff Party alone and immediately ran into some familiar faces some of whom I hadn't seen since the Philly conference. It was great to finally meet Brian Hall of Brouwerij Chugach, Matt Humbard of A Ph.D. in Beer, Marshall and Malcom from Brulosophy.com and Derek Springer from Five Blades Brewing in person. Ive been communicating with all these dudes via the internet but we had never met in person until this night, all great people. I was actually surprised to see so many Philly area breweries at the event, not that it's a long way to travel, and all due respect but I wanted to try local to Baltimore breweries I had no experience with. 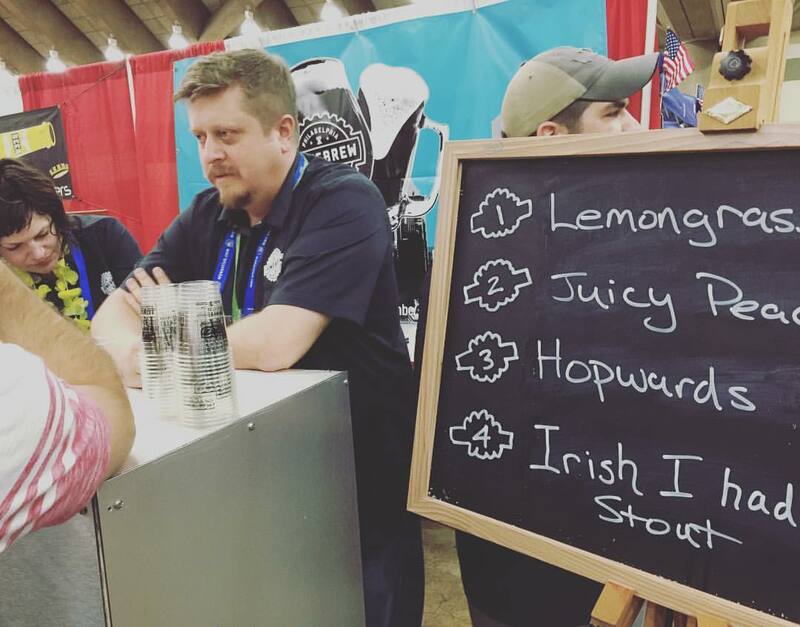 After stopping at a few of those local brewery booths I realized that some Homebrew clubs were pouring as well, including two NEIPA's at the DC Homebrewers booth by Michael Tonsmeire and Scott Janish. Both amazingly juicy and creamy beers, I wish I had just stayed and drank those all night. Once the event ended we stood on the corner for 30 minutes while Marshall called bars looking for karaoke. We grew bit antsy so Brian Hall, Derek Springer, Frank Fletcher ( President of Philly HBC) Tom, Chris and I walked to Alewife for exactly one beer where my buddy Tom fell asleep but not before making fun of us bloggers a bit. Having had a relatively easy night on Thursday I drug myself out of bed to go for a run along the harbor in Baltimore to start the day off right. 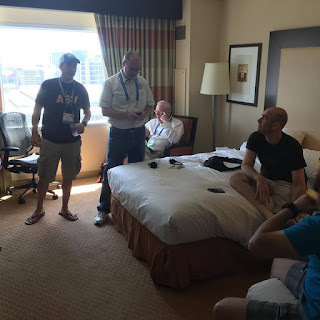 When I got back my roommate Tom was ready to go but before we would hit the expo floor I got a message from Marshall to come to his room to record an episode of Basic Brewing Radio, and bring the beers I brewed for a top secret collaboration Brulosophy xBmt. This was a planned thing but the timing of when we would record was up in the air. I filled a few growlers and Tom, Chris and I went upstairs. A not so exciting photo of us getting ready to record. I was pretty exciting as I had never been on a beer podcast before, and with Homebrew luminaries like James Spencer, Mike Tonsmeire, and Marshall in the room waiting to try my beers in a triangle test I was mostly just hoping they would enjoy the beers! The results of the xBmt will be posted next week, not sure when the episode will be but I imagine not long after, hopefully I don't sound like an idiot! Once we were done recording Marshall, Malcom and I hit the expo floor with kegs of the xBmt beers to pour triangle tests for attendees and collect data. We got a good number of people to sample and I set off to catch Brian Hall's talk. The one thing I regret here is that I had so many commitments that I was only able to sit in on a portion of talks I wanted to see first hand, luckily they will be posted later on. Marshall took the triangle test onto a live episode of Experimental Brewing for a few more data points, after that I was looking to just chill and pack up shop for the day. Tom, Chris and I smashed burgers at Pratt Street Ale House then went to grab my beers for the Milk The Funk meetup from the hotel. I arrived at the Milk The Funk Meetup a few minutes late but it was clear everyone knew the drill. There had to have been 50-60 people outside in the hallway sharing beers and chatting, it was actually a little overwhelming. 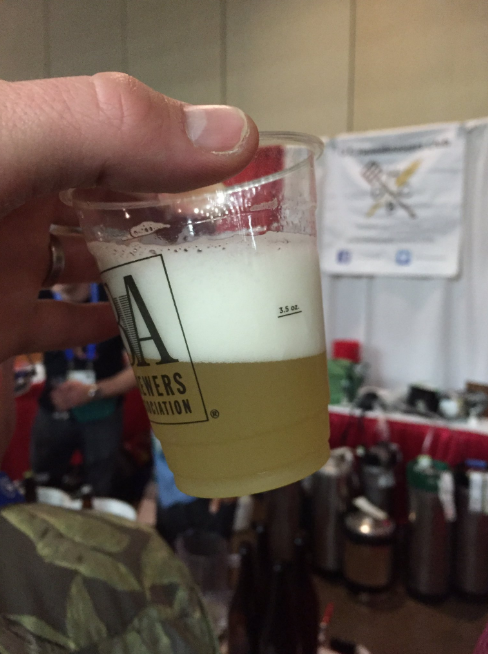 I got to try fantastic beers from Brian Hall, Matt Miller, Mike Tonsmeire, Jamey Barlow, Dave Jansen and many others that I can't even recall. But as a whole the quality of the beers at the share was a class all its own, I wish I could have tried even more of them. So good infact that I only open 2 of the 6 bottles I brought with me to the share, I was bummed to not be able to share with some folks but I was enjoying everyone else's immensely. 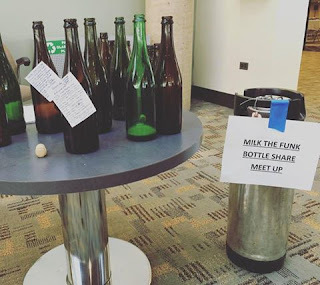 If you weren't able to join us for the meetup fret not as Jeff Mello from Bootleg Biology collected dregs from folks that he plans to prop up and sell at some point. Jeff is a really awesome guy, when the crowds from the share died down I was able to hang with him and his wife to chat a bit. 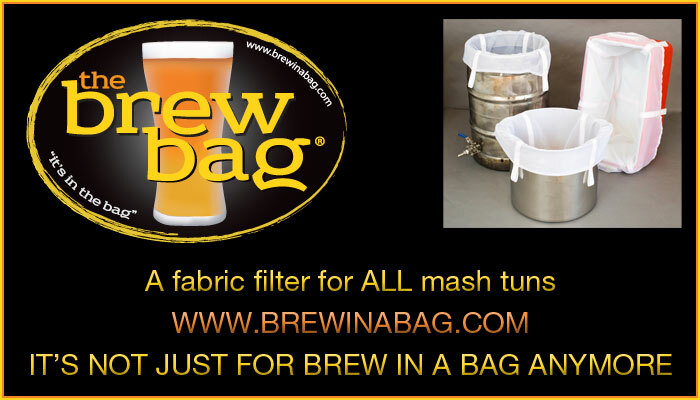 If you're not already looking at his strains and his local yeast project I urge you to keep him on your radar. After the Meet up I had a nice buzz and bit of heartburn with some time to kill, so we walked the Expo floor for a minute then headed to Of Love and Regret for dinner and beers before Club Night. What started as a plan to just stop in devolved into a nearly three hour stay as we sat outside and enjoyed Farmhouse ales, great food, and a super relaxing atmosphere. We grabbed an Uber and arrived at Club Night later than planned but feeling good at 10pm. Club Night was a trip, If you have never been to the conference this is the night all of the clubs set up booths and pour their best beers. A really great event walking the floor chatting with clubs and people you might never meet. I poured HopWards and a blended version of An Ocean Between the Staves at the Philly Homebrew Club booth, it seemed people enjoyed both. I got to meet more great folks, and sample more fantastic beers that I wish I could remember. I might have sampled more beers throughout the night but Derek Springer kindly reminded me that we were set to speak the next morning at 9am! *Gulp*, so off to bed at around midnight. I was up bright and early, ready to go on Saturday, met Marshall in the lobby and walked over to our room to get settled in. Surprisingly I was not nervous, I thought I would be being that I am not much of a public speaker, maybe the booze hadn't worn off yet but I was ready to go. We had a pretty light crowd for our talk, which didn't bother or surprise me much as it's a pretty specific topic. The four of us got a slow start but the conversation got flowing and remained pretty laid back and loose, just as we had planned. Chip Walton moderated for us, which was a great addition to the talk, and a highlight for me as I've always been a big Brewing TV and Chop and Brew fan over the years. I hope everyone enjoyed the banter, we didn't want to come across as know-it-all's especially with the real pro Michael Tonsmeire in the crowd, and I think we achieved that well. HopWards hits the taps on club night. After our talk I sat in on Malcom and Marshall's talk, which was really fun and informative. Afterwards I had a decision to make, I was feeling a little burnt out, and with my hotel roommate planning to split I decided to check out of the hotel room and not stay the night for the banquet. I had planned to then go to Tonsmeire's talk at 2pm but with the car loaded with all my kegs and bottles I decided to pull and Irish exit. So I apologize to all I didn't say good bye to, it sounds like everyone got along just fine at the Banquet without me. It was a whirlwind conference and I had a seriously great time, learned a bunch and made more connections with folks than I had expected to. I tried to mention as many as the folks I hung with throughout the conference, sorry if I missed anyone, I was drinking. If you have never been to the conference you really have to go at least once, its a wild and unique beer experience thats unmatched anywhere that I have been. I'm hoping Minneapolis 2017 will be in the cards for me, because this years conference was really one to remember I can only imagine next year will be more of the same. Haha, everyone's post this year includes some line "Derek reminded me I have responsibilities tomorrow." Apparently I am the HBC task-master! It's because at one point, like 100% if all people that use Blogger, there was a link in my Google profile and I said "why not?"